Not just famous for its beaches, the Gold Coast has 24 registered golf clubs, several of which were designed by Jack Nicklaus, Greg Norman, Peter Thomson and Arnold Palmer, making South East Queensland home to the greatest collection of resort courses in Australia. Our pick is The Glades. It’s only a 5 minute drive from the retreat and is arguably Greg Norman’s finest course, with challenging layouts and many bunkers; 98 in total. His sensitive design also allowed for the surrounding wetland to be maintained, creating a sanctuary within the course. Royal Pines is where the Australian PGA Championships are held, as well as the Australian Ladies Masters. It’s another great course, and the RACV resort attached has an impressive restaurant on the 21st floor – ideal for taking in the panoramic views after your game. If a very casual, social hit is more what you’re after then the Tallai Country Golf Club is just 2 minutes away and offers a welcoming 9 hole course. Watch out for the kangaroos on the fairways here which is possibly why its motto is ‘The toughest 9 holes on the Gold Coast’! Some nearby towns are well worth a visit. Murwillumbah is a cultural hub with art galleries congregating here. Most notable is the Margaret Olley Art Centre whi ch is part of the Tweed Regional Gallery. Her studio from Paddington in Sydney has been recreated with over 20,000 items Olley collected over her life as subject matter for her still life paintings. Byron Bay with all it has to offer is only one hour from the retreat and so worth the trip. A walk up to the lighthouse, the most easterly point of Australia, is breathtakingly beautiful. The fun laid back vibe of Byron with all its eclectic people and shops makes it a great day trip. Just over the NSW border you will find other beaches such as Kingscliff and Casuarina which are great to have walk on the beach and lunch in the local pub. 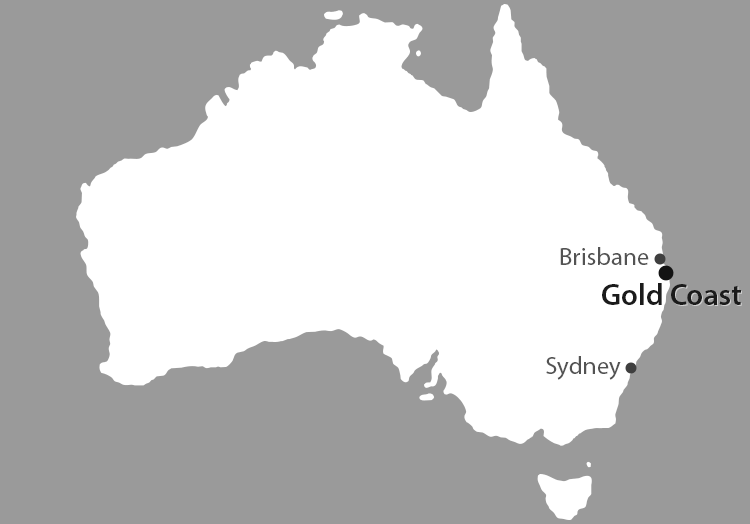 Of ocurse Brisbane is only one hour drive away and has the Queensland Performing Arts Centre with international shows coming continually. Check the guide for whats on and make sure you allow time to catch the jetcat and experience Brisbane from the river. Dinner on Southbank before a show and then an easy drive home. Stretched out over 57km of pristine coastline you will find some of the most popular surf breaks and beach locations in, not only Australia, but also the world. Always a popular surfing destination due to its widely renowned surf break Burleigh Heads is a hotspot for weekend barbecues and picnics due to its large, scenic park which overlooks the ocean. There is a fabulous walk around the Burleigh hill to Tallebudgeera which is easy and has some beautiful lookout points along the way. Also Burleigh Heads has one of the only spots that has some fine dining options literally right on the ocean: Oskars and Rick Shores are worth booking. Greenmount Beach and Rainbow Bay at Coolangatta- are the Gold Coast’s only north-facing beaches which helps to provide excellent, sheltered conditions that are ideal for swimming. A stroll around the point to nearby Snapper Rocks can also give you an increased chance of seeing whales passing on their annual migration throughout the year’s cooler months. This is where the Quicksilver Pro is held so you can watch some amazing surfers do their thing. One of the last original surf clubs is Rainbow Bay Surf Club Bar faces north west and makes a great view of the north facing beaches not to mention a glass or two as the sun goes down with views back to the hinterland. Currumbin’s beaches form a lovely balance between a family destination – with sheltered off, shark-netted swimming areas and nearby parks ideal for barbecues – with a great spot for surfers and other water-sports enthusiasts offered by Currumbin Alley. There are plenty of learn to surf opportunities at the Alley for those who want to have a go! Elephant rock is at Currumbin with stairs to climb to the top to look North and South to see the full stretch of the gold Coast. The Gold coast is home to Australia’s largest array of theme parks. Warner bros Movie World, Wet’n’Wild, and Seaworld have great package passes. Dreamworld and Whitewater world have their own packages. All are amazing and depending on your level of thrill-seeking and wildlife interest you can tailor a few days of theme parks to suit the group. We highly recommend going to the RM Outback Spectacular. It is an amazing show and a great tribute to the Australian way of life. The meal provided is excellent and the before show interaction with the animals along with a take home hat makes it a great night out!